In order to understand the proliferation of parametrically designed pavilions in the last two decades, one must comprehend the paradigm shift in contemporary architecture and in information rich environments, which is occurring not only in the design and making processes of designers’ end but also in the users end mode of interactions and potential opportunities for multiple communications. 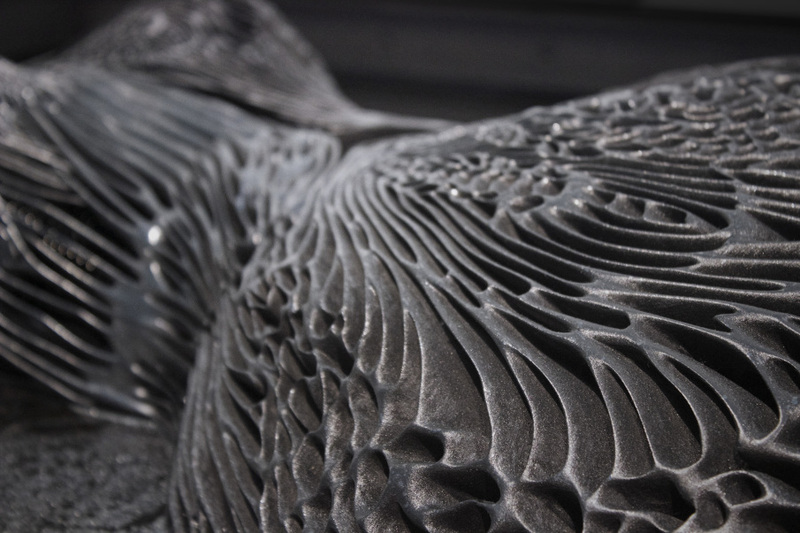 The transition from Computer Aided Design to Algorithm Aided Design has raised questions on new modes of collaboration, new advanced fabrication processes, approach to sustainability, questions of design authorship and most importantly presented the challenge of a new aesthetic. The shift to an information-rich society, where most if not all, social interactions are materialised in a virtual network, has been adopted and embraced by self-organised communities of designers, who operate as an open-source platform. These communities of the algorithm-based designers have developed an open discourse of sharing scripts, exchanging ideas, publishing tutorials and in fact by doing so, introduced a worldwide accelerating debate on current professional issues. This mode of operation on the designer-end has simultaneously expanded to architectural schools, which naturally began to rethink their pedagogical approach. Universities around the world, amongst them the Architectural Association in London and The ICD/ITKE of the University of Stuttgart, developed methodologies of Design Research, exploring a case study of design and construction of a ParaPavilion. For instance, see below ‘Interactive Panorama Pavilion 2013-14 by ICD/ITKE, which was conceived as a collaborative effort between students, architects, biologists, engineers and palaeontologists. …these academic pavilions are placed in an urban space … establishing a new order within the surrounding built environment. These objects in the urban realm act as a 1:1 scale prototype, allowing designers to test their ideas on an actual human scale and receive the user’s feedback instantaneously. Like the virtual world, the pavilion offers constant accessibility, a continuous discourse with its users, who are invited to capitalise the space, inhabit it or pass through. The users, who are typically the city explorers (the flâneur), occupy the space randomly and by their diverse arbitrary movements, reorder the space, as a self-organising system, and create unpredictable spatial configuration as well as multiple social interactions. The fundamental aesthetics of the pavilion typology is of ephemerality and high degree of permeability; therefore the articulation and the tectonics of the envelope are defining features of the space’s experiential effects, as well as of the object’s uniqueness. Perforations, as an integral component of the enclosure, are essential for light penetration, but even more so, for communication amongst users, which allow a continuous flow between internal and external spaces. In the ParaPavilion, penetrations have transformed to component-based fields and to digital patterns, which can be parametrically controlled, differentiated and customised. Diverse optimisation methods, which can resolve surface panelisation and tiling stacking, distanced designers from the orthogonal grids and shifted the interest towards three-dimensional grids, aperiodic tiling and patterns, which are offering new visual and aesthetic qualities of non-identical complexity. To name a few pavilions … The Arum installation by Zaha Hadid Architects for the Venice Biennale 2012, is a flower-like pleated metal geometry, presenting the idea of marrying the analogue paper folding and digital methods –Fig 4. Likewise, the pavilion, ‘Candela Revisited’, which was designed by Zaha Hadid Architects for the China international Architectural Biennial 2013 is a three hyperbolic paraboloids opening up in all directions to provide access and a visual focal point with their tips meeting high in the air, creating a full ephemeral affect –Figs 1 & 2. Fig 4. The Arum installations by Zaha Hadid Architects for the Venice Biennale 2012. Photos credit. Sergio Pirrone. This platform for new experimentation, resulting in new aesthetics of the ParaPavilions, is clearly only possible due to generative parametric tools and new interaction modes, while deepening the synergies between architectural articulation, engineering logic and fabrication constraints. The discourse, which incorporates the collective open resources of the designers’ community, the specific designer, the engineer, the fabricator and the user, is enhanced by proliferation of built ParaPavilions but, beyond all considered parameters, it is crucial to allow the space for intuition and for the human creative act, which will always precede the digital act. * Anat Stern is an architect and a researcher, currently working as a Lead designer at Zaha Hadid Architects, being involved in international projects at all scales across Spain, Russia, China, Abu-Dhabi, and the UK. She graduated from Betzalel Academy in Jerusalem with Honours List and achieved her MA degree at the Architectural Association, in the DRL – Design Research Laboratory programme in 2003. Her MA thesis work on Responsive environments was published and exhibited across Europe. Her Academic work includes teaching at the Architectural Association, teaching as a visiting lecturer at the University of Westminster, lecturing in London Metropolitan University and in several universities across Israel. She was an invited as a guest critic for final students’ reviews at the Architectural Associations, London MET, RCA, University of Westminster, University of Greenwich, and in universities across Israel. Could our daily interactions and social scenarios with in the city be enabled to restructure our environments through collective interaction? What if our everyday local interactions and behaviors were allowed to construct communities and social fabric as living environments that would operate through a collective intelligence that is adaptive and can evolve? Emotive City is a framework to explore a mobile and self-organizing model for our contemporary city. Models of the past have proven limited and should not operate, as blueprints for our urban future, a new generation of design enquiry by necessity must address the challenges of today. The fixed and finite tendencies that once served architecture and urbanism have been rendered obsolete. Today the intersections of information, life, machines and matter display complexities that suggest the possibility of a much deeper synthesis. Within this context, architecture is being forced to radically refactor its response to new social and cultural challenges with an environment of accelerated urbanization. We propose a framework that participates and engages with the information-rich environments that are shaping our lives through a model of living that we call an adaptive ecology. Interaction within this project enables communication and real-time reorganization on multiple scales of engagement. Our interactive model is scenario based and asks what if our living environments were durational, mobile and energy producing could we conceive of a model of city organization that is not tied to infrastructural but would be governed locally through neighborhood relations. The model proposed is an alternative experiment to planning that acknowledges the limited capacity of systems that segregate architecture, infrastructure, urbanism and the inhabitants. Our prototype examines a model structure through engagement and social interaction that within mobile and flexible infrastructure can dynamically address issues of latency and the unknown. As a response to Nesta’s Future of Machines theme -at FutureFest, where the installation was first presented- we felt that our living environments by necessity should be part of the conversation as we actively move towards an understanding of the human machine ecologies that are forming around us. The emotive city uses interaction as a fundamental communication model to create ecologies of mobile and self structuring habitual environments, a new nature of human machine interactions that are structured through behaviors. Our architecture will be self-aware. Our architecture will get bored. Our architecture will be emotive. Team: Ilya Pereyaslavtsev, María Paula Velásquez, Fanos Katsaris, Octavian Gheorghiu, Hitesh Katiyar, Flavia Ghirotto Santos, Mostafa El Sayed , Iris Jiang, Pavlina Vardoulaki and Houzhe Xu. Minimaforms was founded in 2002 by brothers Stephen and Theodore Spyropoulos as an experimental architecture and design practice. Using design as a mode of enquiry, the studio explores projects that enable new forms of communication. 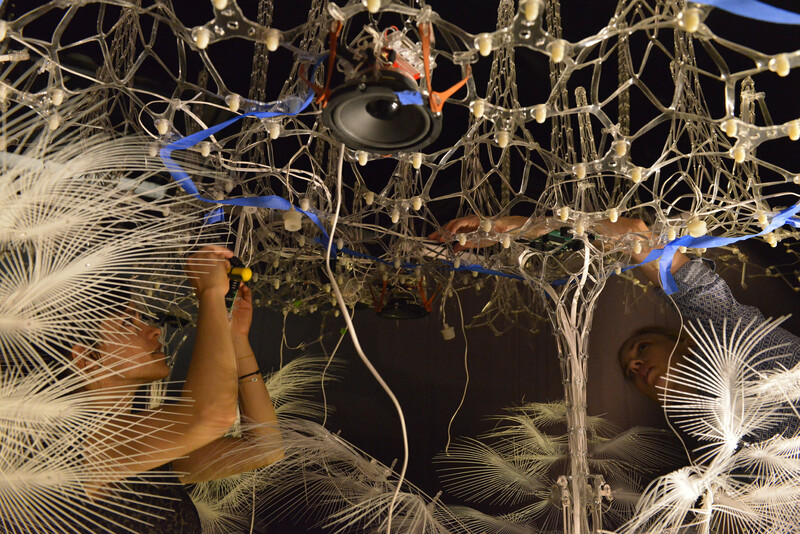 Embracing a generative and behavioral approach the studio develops open systems that construct participatory and interactive frameworks that engage the everyday. Their work has received international attention which have included nominations for the International Chernikhov Prize in architecture, named one of the top ten international public art installations by the Telegraph for their work Memory Cloud and most recently they were awarded best idea / creative work in the 5th Chinese International Beijing Biennale. 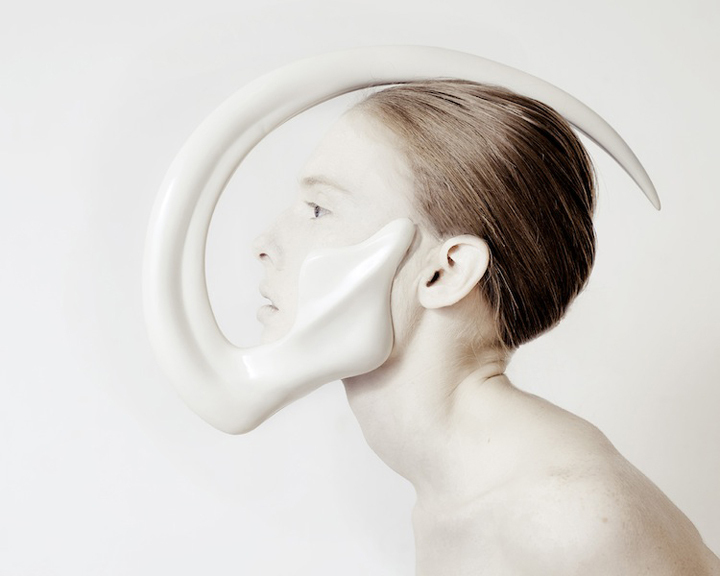 ANIMAL: The Other Side of Evolution* by Ana Rajcevic is a collection of pieces of personal adornment that introduces ‘a new breed’ of precious objects. Stepping out of the traditional jewellery/ accessories context, Rajcevic offers a collection that can exist and be exhibited both on their own and attached to the human body. ANIMAL pieces are inspired by the anatomy of animals, in particular, by skeleton structures. Attached to the human body these pieces ‘appear as natural properties of the body, suggesting strength, power and sensuality’, says Ana Rajcevic. Merging the human and animal anatomies, Rajcevic presents us with a new body, one that -through this manipulation- appears to be more directly immersed within the context of natural life. ‘All the objects –of the collection- were handcrafted creating multi-part master holds, using gelcoat, fibreglass, resin and silicone rubber’, explains Rajcevic. The materiality and fluid morphology of ANIMAL collection present similarities with some of the most contemporary architectural and design propositions of our times. An example of these propositions being the Chanel pavilion by Zaha Hadid Architects, showcasing a skin manufactured from Fibre Reinforced Polymer. Making use of contemporary material technologies and exploring fluid natural forms as means to re-define the way in which the human body is presented, Rajcevic’s work certainly joins the avant-garde section of contemporary designers that operate trans-disciplinary towards the re-definition of our the cultural and physical environments. In the 1980s, theorists in the humanities and technology sciences envisioned a new stage in human development: the Posthuman. They saw the Posthuman as a type of cybernetic organism—a cyborg—in which physical and intelligence-based modifications are co-produced with machines. With the technological developments of the 2000s, many of their predictions started coming true. The recent near-ubiquity of personal internet devices and oncoming wearable technologies bring the posthuman closer, and less like science-fiction. This thesis imagines a fictional architecture that trains its occupants towards a posthuman existence. For humans to complete their transition into the posthuman the architectural environment must become a training apparatus, a type of propaedeutic, where our built developments simultaneously develop us. This project fashions waste, ingestion, lounging, and bathing environments as components of our posthuman training grounds. Within posthumanism, singularity does not occur—we do not transcend our anatomy into some type of digital non-space. Despite our advanced technology, our bodies remain legitimate. Spaces remain legitimate. As posthumans we will use our environment and our bodies as medium, mediator, and modifier to filter, flavor, and fashion our information. Boundaries blur, consciousness becomes augmented, and architecture and the body act as symbiotic prosthetics not only for each other, but socially and ecologically. 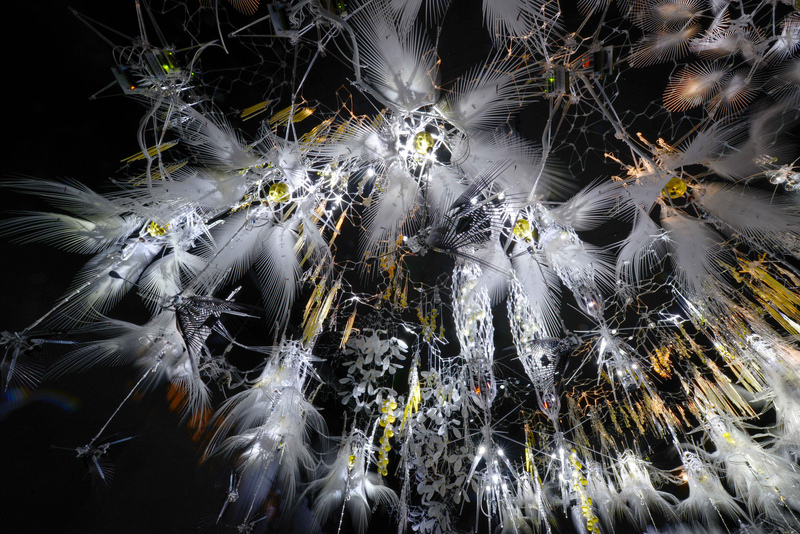 Here is a land where telepresence meshes with corporeality—where the digital is also sensorial. Automation and autonomy are no longer antonyms—and our sentience is allowed to flicker between the various realities to which it is tethered. Here, architecture serves as the suture between our digital and physical lives, creating a truly networked body from the scale of the global to the microbial. Buildings can no longer be the wire mothers of Harry F. Harlow’s psychological experiments on attachment. Rather than attempting to chill occupants into humanist superiority, architecture must become the cloth mother, which we posthumans nuzzle, in order to truly connect. As a posthuman you recognize that your body can be architecture… and your architecture can be body. 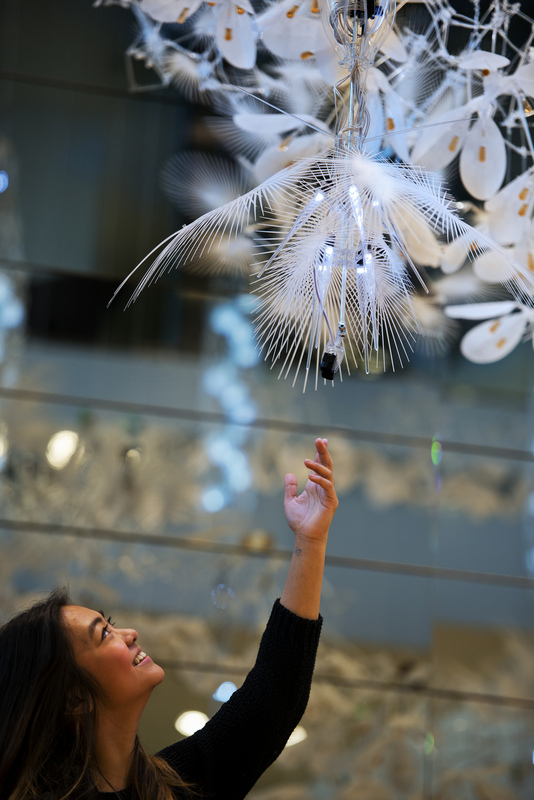 Living in the northern hemisphere at this time of the year, one feels particularly well positioned to understand Philip Beesley’s installation “Epiphyte Spring”. Springtime is the season of blossoming, ripeness and exuberance; a time in which life is perceived all around us, awakening, unfolding. Beesley’s installation immerses us in this world, not only as spectators, but as active participants of this vital moment of nature. This works in quiet ways, setting out ghost-like crystalline forms following diagrids and textile forms in order to make lightweight, resonant scaffolds. Networks of simple computational devices and sensors allow viewers to be tracked, offering small increments of gentle muscular movements that register our own presence. The most recent generations of these works feature interactive lighting systems and kinetic mechanisms that use dense arrays of microprocessors and sensors. Chemical protocell metabolisms are in the early stages of development within many of these environments. These works contemplate the ability of an environment to be near-living, to stimulate intimate evocations of compassion with viewers through artificial intelligence and mechanical empathy. Offering visitors the opportunity to physically interact with their surroundings, Beesley’s work impacts us on both cognitive and sensitive levels. While contributing to architectural research focused on understanding natural behaviour, Beesley’s installations place us in a relationship of reciprocal caressing between humans and natural-like organisms. Is the construction of this relationship that seems to be one of the greatest achievements of these works, as becomes the propelling force that precedes all commitment to the development of a more sustainable built environment. The articulation of matter and form seems to be at the core of some of the most striking works of Quayola, in particular the ongoing series of digital and physical sculptures “Captives” and the time-based digital sculpture “Matter”, completed by Quayola in 2012. Using as starting points Michelangelo’s unfinished series “Prigioni” and Rodin’s sculpture “Le Penseur” respectively, form and matter are explored in these two works of Quayola through the articulation of –geometrically reconstructed- raw matter and human form. 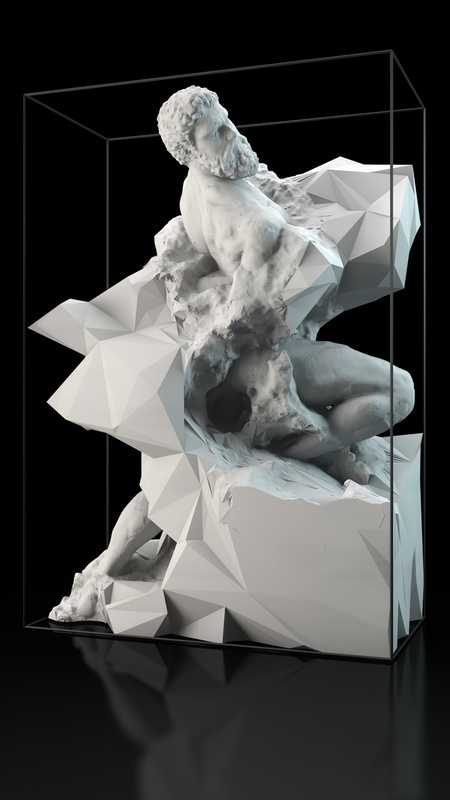 In “Captives”, Michelangelo’s articulation of matter and form is recreated and iterated potentially endlessly through the use of computer run mathematical functions and processes. 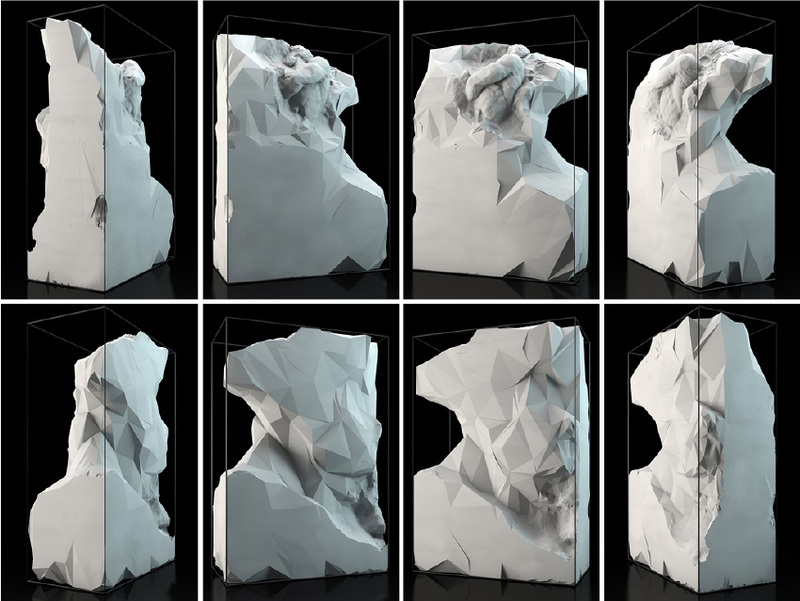 The use of contemporary computation power, thus not only allows the reproduction of “Prigioni” but at the same time alters the work, by enabling the materialization of multiple variations of the boundary between matter and form. In “Matter”, the variation of the boundary between raw matter and human form is displayed as a process in time. The incorporation of ‘time’ to Quayola’s sculpture transforms this boundary into a dynamic field that fluctuates between revealing the codified –human form- and retaining or becoming uncodified –matter. The unidirectional process of ‘revealing’ form by subtracting matter implicit in Michelangelo’s and Rodin’s methods of sculpting is enriched in Quayola’s works by being simultaneously paused and reversed. Form and matter become aspects of the same entity, where human form has the potential to ‘return’ to a state of matter. Quayola’s virtuoso recreation of the tension between matter and form adds a contemporary expression to the human qualities of strength, sensuality and introversion so exceptionally conveyed in Michelangelo’s and Rodin’s sculptures. The nature of this contemporary expression seems to lie within the power of its medium: computation. 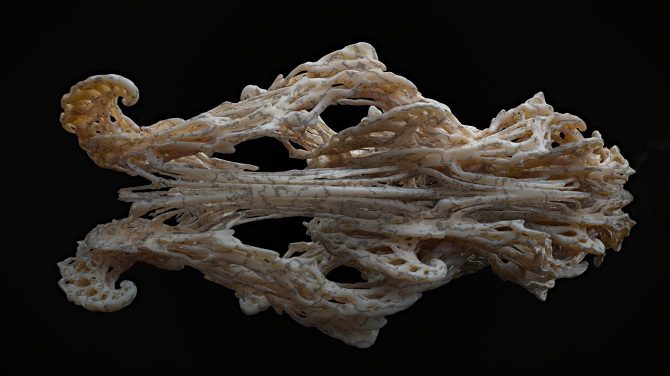 While as works of art Quayola’s pieces trigger the imagination of realities that may appear to be hypothetical, the state-of-the-art computation increasingly renders them as possibilities. Decadence is a process of disintegration of the whole where the particular acquires autonomy and incrementation of visibility by shirking from the functional subordination of the whole. It is about the process of decomposition of an organism, of a society or a culture and, more generally, it concerns the process of fragmentation of a system of relations. It is within this process of fragmentation of a given system that Casas researches what he calls a potential aesthetic of (high) entropy. At the core of this search, we find the belief that in the dynamic transitions that take place within decadence, there is the very seed for renewal. 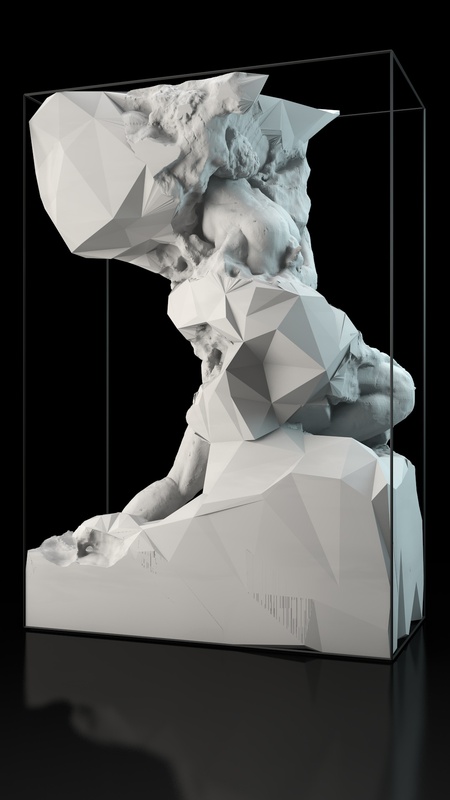 Casas’ design efforts are thus focused on exploring the possibilities of simulating the process of decadence, which he currently carries out through the manipulation fractal geometries. For Casas, if we consider decadence as a state of dynamic transition leading to the fragmentation of the whole, it is the fractal geometry that articulates this process. 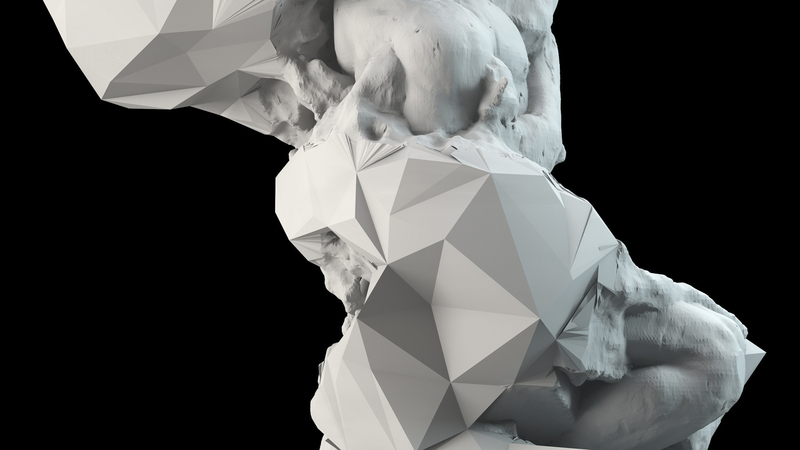 To develop his research Casas makes use of state-of-the-art computation, which allows him to calculate the infinite process of self-similar repetition characteristic of fractal geometries and to simulate the development of these theoretically endless shapes that only computers can reproduce. Furthermore, the use of computer aided manufacturing techniques such as 3D printing have allowed Casas not only to materialize his research, but also to slowly overcome the state of experimentation. A current testing ground for Casas has been the clothing industry, where he has arrived to through collaborations with fashion and product designers who have given their industries’ first steps in the use of 3D printing. In this respect, Casas’ ventures join the broader contemporary design avant-garde practice where the use of 3D printing as manufacturing technique has bridged disciplines that were once apart. Disciplines are merging and reconfiguring thanks to emerging of new technologies, this allows for highly fertile and productive multidisciplinary approaches to take place. In this context, Architects often operate in roles once considered far from the discipline; the advantage is that they develop new skills, knowledge and aesthetic sensitivities, Casas points out. In particular, Casas’ incursion within the fashion industry has provided him with a testing scale for architecture, the body, and as counterpart his projects open up questions about the scale and nature of architecture. In communication with Casas he emphasises the unpredictability of research; in fact, what these skins and their embedded logic can bring to the materialization of our future environments is still uncertain. However, we look very much forward to see. Tableware as Sensorial Stimuli project by Jinhyun Jeon involves a series of cutlery pieces designed to enhance the experience of eating. 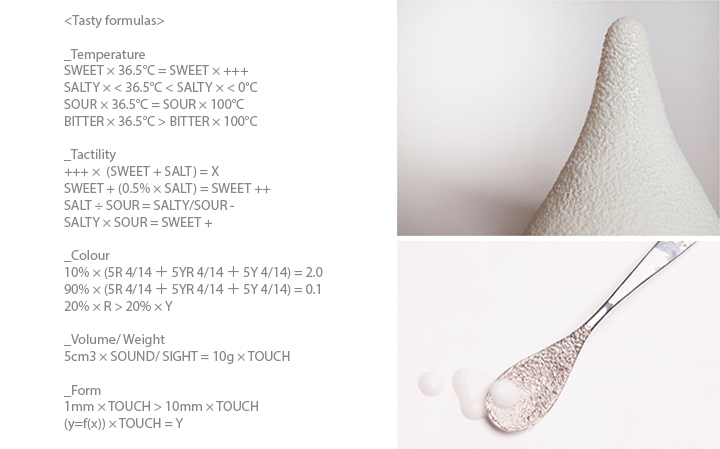 Under the belief that ‘cutlery should do more than merely placing food in our mouth’ Jinhyun Jeon looks at the world of synaesthesia as a means to inform and bring her design work to a different level. Synaesthesia -as explained by Jeon- is a neurological condition where stimulus to one sense can affect one or more of the other senses. With this phenomenon underpinning her design process, Jinhyun Jeon’s pieces are created following ‘tasty’ formulas that combine the 5 elements of temperature, colour, texture, volume/ weight and form. Crafted to engage with and stimulate different senses, Jinhyun Jeon’s cutlery is an example of design work that responds to and interacts with the human body for which it is designed. The intended performativity of Jinhyun Jeon’s work distances her pieces from design that is based on aesthetic decisions only, and defines a language that is justified by its performance. Furthermore, by allowing more than only our taste buds to engage in the act of eating, Jinhyun Jeon enriches and expands the repertoire of what tableware can do, thus producing an innovation. Beyond the achievement of a particular performance, Jinhyun Jeon’s innovation represents the materialization of a vision, and as such the success of creative work. Tableware as sensorial stimuli proposes a disruption of pattern, a channel within our lives to a multi-sensorial experience. Through her proposal Jinhyun Jeon reminds both designers and users alike of the richness of physical experiences; crucially in times in which the visual and virtual seem to outweigh them.